Water Conservation: Managed properly, a lawn sprinkler system will keep your lawn and landscape well watered and healthy, while making the most of every drop of water. That’s a greater concern in some locales than in others, but globally, water is becoming an ever-more-precious resource. So conserving water is simply the right thing to do, even if your community doesn’t yet enforce conservation standards. Convenience: Manually watering your lawn and landscape involves dragging hoses and sprinklers all over your landscape all summer long. It’s a royal pain in the behind (and we know you have better things to do!). With a lawn sprinkler system, all you have to do is set the controller, and your landscape will be watered to perfection every time. The Health and Appearance of Your Landscape: Automated sprinkler systems are easier on you, but they’re also better for your lawn. That’s because a well-designed system will apply water evenly, and in just the right amount, to every nook and cranny of your landscape. Applying water evenly by manually dragging around and positioning sprinklers is a virtual impossibility. Property Value Bump: If the time comes to sell your home, most realtors agree than a landscape sprinkler system will give your property value a nice nudge in the right direction. The degree of increased valuation depends upon a number of variables. But savvy homebuyers understand the benefits that a sprinkler system provides, and are willing to pay a bonus for those benefits. If you’ve been thinking for some time about having a system installed, now would be a great time to pull the trigger. That’s because springtime is the best time of the year to have a sprinkler system installed. Don’t think about it for too long, though. Because though we currently have openings in our spring installation schedule, it’s filling up fast. You’re not the only fence-sitter thinking about climbing down, you know! 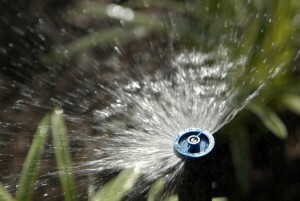 Did you know… the average cost of an lawn sprinkler / irrigation system for a 10,000 square foot lot is $4,500. When installed correctly, as it will be by the professionals at TLC, Inc, the system will last 15 years or more. All things considered, isn’t it worth investing under $1 a day to make sure your lawn and outdoor landscaping is protected by a professionally-installed lawn sprinkler / irrigation system? Your men installed a lawn sprinkler / irrigation system for me last fall. It is a great investment. I won’t have to waste time (who has any nowadays anyway?) to drag hoses around this upcoming summer. What a relief that will be! Julio was the foreman on my system installation and really represented your organization well. I just wanted to say thank to you and your company for taking care of my property when they installed my lawn sprinkler / irrigation system. Julio and his men took care of it like they owned it themselves. I can’t wait to have it turned back on this spring!